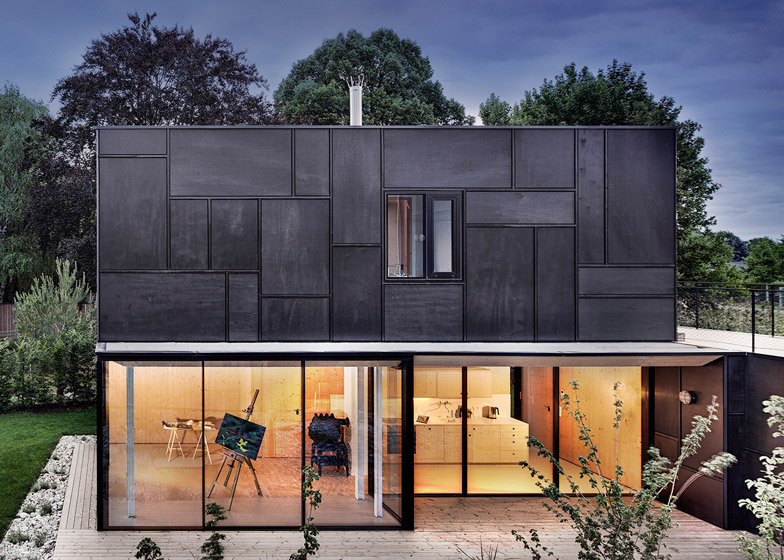 This blackened-timber house by Maximilian Eisenköck provides a holiday home for three siblings and their spouses overlooking a lake near Vienna (+ slideshow). 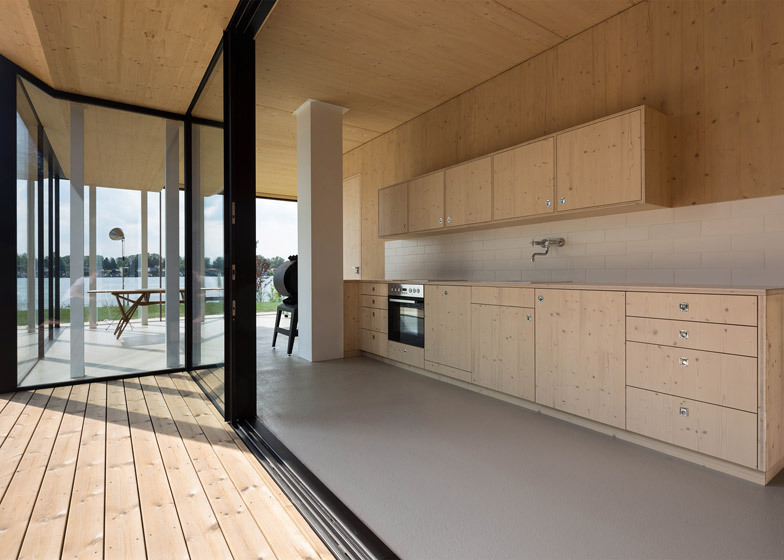 Austrian architect Maximilian Eisenköck designed the summer house for a plot on the shore of Neufeldersee, a lake located just 30 miles south of Vienna. The lake, which is owned by the royal Esterházy family, was created when an old coal mine was flooded and is now a popular holidaying spot. 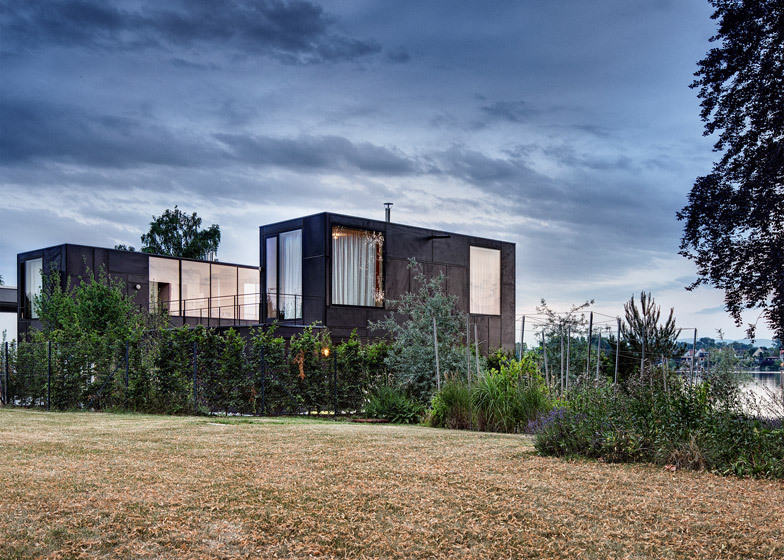 The U-shaped residence, formed from a pair of two-storey wings connected by a single-height block, is covered in a grid of blackened timber panels and has large floor-to-ceiling windows that face the water. 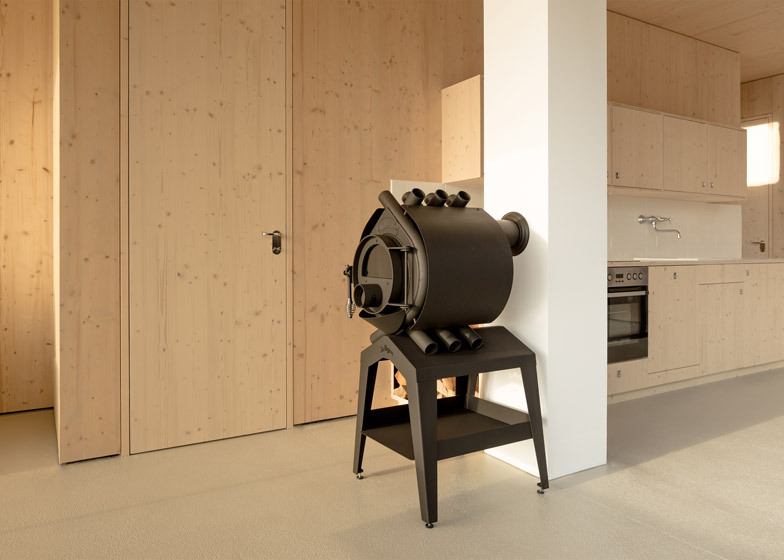 The design is based on the childhood holiday home of the three clients, who were encouraged to commission the 220-square-metre home by their parents to be near their own lakeside house. "When the parents started encouraging the children to build a house close to their own on the lake the children remembered a holiday home on the Neusiedlersee [Lake Neusiedl] they often spent their weekends in when they were young," Eisenköck told Dezeen. "So this is a translation of their childhood memories into a contemporary piece of architecture." The residence contains three separate apartments – one two-storey unit on the north side and two single-storey units on the south. The single-storey block that connects the two wings contains a shared sauna and utility room, and is topped by a roof terrace. A courtyard garden at the centre of the site is enclosed on three sides by the building, while its third side is left open to the water and views of the evening sunset. "The design was made in a way that they all meet in the patio and from there have the perfect view on the lake," said the architect. Large windows face towards the shore and a courtyard at the centre of the site, while the sides and back of the building are covered in panels of blackened African Okume wood to provide privacy. 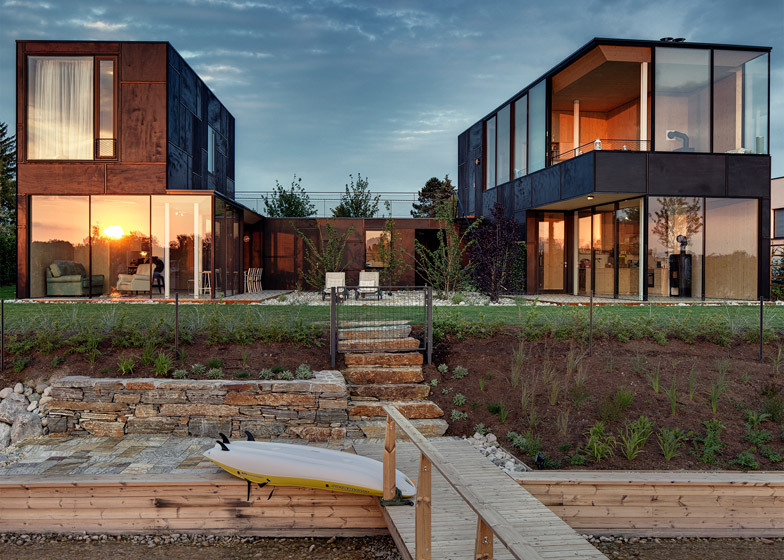 Auckland firm Cheshire Architects used the same screening technique for a pair of black timber cabins that face the Tasman Sea. "It was the only way to get the complex geometry done without cold spots and with the demanded slim dimensions," explained Eisenköck. The full-height windows in the north-facing walls maximise natural light in living spaces and a studio used by one of the clients for painting. "In some places the height of the glazing reaches up to the top of the building itself and dematerialises itself in this manner," said the architect. Pale timber cabinetry and white tiling within each of the three residences contrasts with the inky black cladding and helps to reflect light. The residence, which is Maximilian Eisenköcks first completed project, is among the growing number of holiday homes that seek to minimise their impact on their sites. Examples include an angular extension to a retirement home in Queensland that was designed by Brisbane studio Vokes and Peters to imitate the volcanic landscape, while a Scottish holiday home by WT Architecture masquerades as an old stone mill. Instead of trying to make the building blend into its surroundings, Eisenköck concentrated on avoiding sprawl. By taking into consideration the collective needs of the siblings, he was able to avoid building three individual homes. 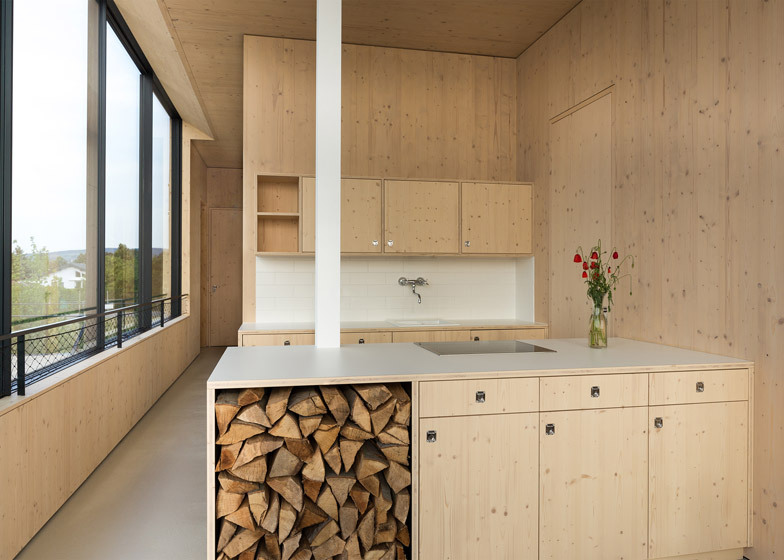 "Space is not endless and a growing awareness of ecology influences our architecture – especially if it is a holiday home," said Eisenköck. "We could have ended up building three separate bungalows but we limited ourselves in terms of interior space and tried to combine the outdoor space, sauna, store room as well as we could," he added. "This enabled us to gain a lot of garden space and made the house look like a single family house." Photography is by Maximilian Eisenköck.